Prior to the release of “Cars 3” people said there was no reason for this movie to exist. 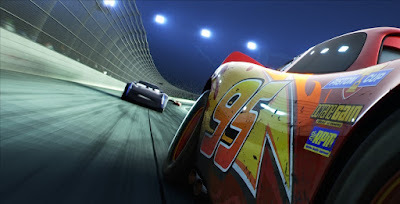 The previous film – “Cars 2” – was already a pointless affair that angered even fans of the original movie, and remains the biggest black spot on Pixar’s otherwise stellar report card. To go back to this a third time felt even more like they were in it to sell toys. To be sure, there are many new characters to be found and I’m sure your kids WILL want the action figures by the time the movie is over! 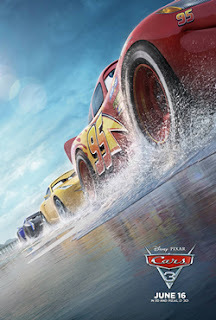 If nothing else though “Cars 3” exists, I suspect, because Pixar needed to forget “Cars 2” ever happened. They felt compelled to end this series on a good note. I have personally spent time with Pixar animators and directors, and I know how seriously they take their work. I walked the halls of the animation studio when “Cars 2” was about to be released, and artwork and sculptures of the film stood right alongside the then in production “Brave.” They were proud of their work, and the aftermath of the release most likely shook them. The negative reception reminded them that they were not invincible. John Lasseter (who does not return to direct this time around) was said to be most affected by the reception, as he simply wanted to make a spy movie for the family, and in his eagerness, he underestimated how much people liked the quiet nature of the first film (and maybe overestimated how much people enjoyed Tow Mater). Instead of spy vehicles and international espionage, “Cars 3” opens with Lightening McQueen (Owen Wilson) preparing for a race. He is a successful veteran at this point in time, having won the Piston Cup a few times, and now races while his friends watch happily from the sideline. Life has very much improved since he learned to have friends, but missing is his old mentor Doc Hudson (Paul Newman), who died several years ago. That loss is being felt now more than ever as new cars are coming onto the race track. They have better equipment, are shinier, and break world records in terms of speed with relative ease. Now, McQueen is facing the possibility that he is too old to race. The rookies are coming in and the veterans are retiring. If this is the case, then what is the purpose of life? Racing is what he does and he loves to it. If he is too old to continue…that would be truly depressing. This, I want to add, is what “Cars 2” should have been about. There was always something thoughtful about the way that “Cars” used a world of fast cars to tell a story of a life that may very well be missed if you didn’t slow down and look at the flowers once in awhile. “Cars 3” is about what happens when all you can do is slow down. Would you miss being able to participate in the race of life again? It feels like a natural progression to the first film, and it’s a shame it took so long to get it.